Item # 303543 Stash Points: 1,697 (?) This is the number of points you get in The Zumiez Stash for purchasing this item. Stash points are redeemable for exclusive rewards only available to Zumiez Stash members. To redeem your points check out the rewards catalog on thestash.zumiez.com. Get inspired to skate or simply complete your laid back outfits with Thrasher Magazine's signature Flame Rope Navy Snapback Hat. Featured with the brand's iconic flame font designed logo script across the front crown, accompanied by a stylish gold rope featured across the top of the straight bill. 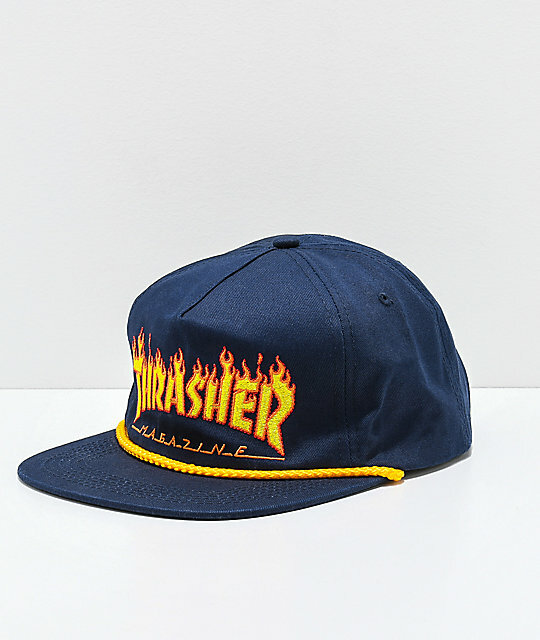 Flame Rope Navy Snapback Hat from Thrasher. Straight bill with gold rope.